William Richard Edwards Mitchelmore was born in April 1863 in Kingsbridge, Devon and baptised on 3 October 1863 at Halerstone, East Allington. The 1871 census showed him as a scholar at home with his parents; agricultural labourer William Mudge Mitchelmore and Elizabeth, née Edwards, at Halerstone. By 1881 he was employed as an indoors farm servant at Strete Farm, Blackawton. In March 1887 he opened the Abbey Hotel & Coffee Tavern, a temperance (that is alcohol-free) establishment in Glastonbury and the 1891 census listed him as a temperance hotel proprietor at 3-5 Benedict Street, Glastonbury. 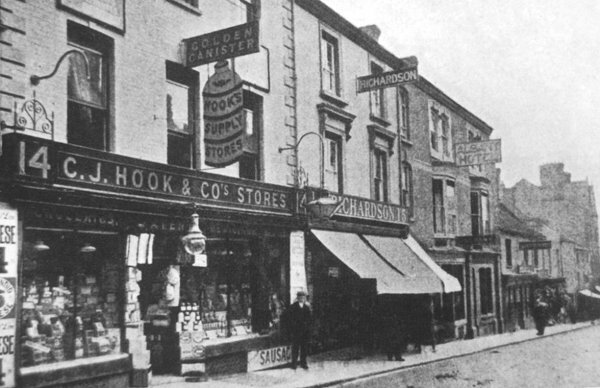 In 1895 he moved to Yeovil, taking over the Albany Temperance Hotel & Coffee Tavern at 17 Middle Street. In the 1901 census he was listed as a Hotel Proprietor (Temperance) at the Albany Temperance Hotel together with Ellen and Howard, a domestic servant, a waitress and a boots together with two hotel guests. Between 1914 and 1919 he was listed as the hotel keeper of the Albany Temperance Hotel & Coffee Tavern in Middle Street and also the Fernleigh Commercial Temperance Hotel, on the corner of Middle Street and Station Road, another temperance establishment. 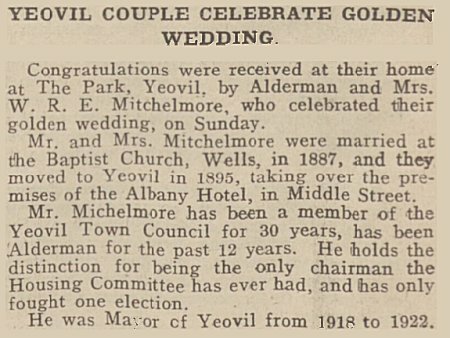 In 1907 he entered local politics and was elected to Yeovil Town Council and was elected mayor of Yeovil and held the position between 1918 and 1921. Being the first of Yeovil's mayors to be elected after the First World War, he was known as the "Peace Mayor". As something of an antiquarian, he brought together many different collections now housed in the Community Heritage Access Centre at Lufton. 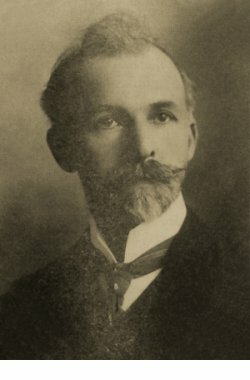 He was made an Alderman in 1925. He was the first curator of Yeovil Museum and was instrumental in researching the Roman remains at Westlands. 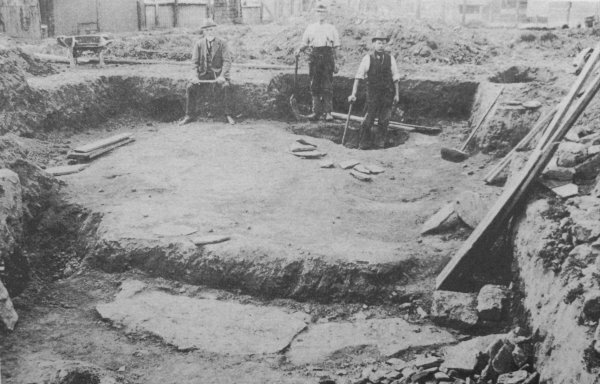 In 1926 discovered a barrow near Barwick Park. 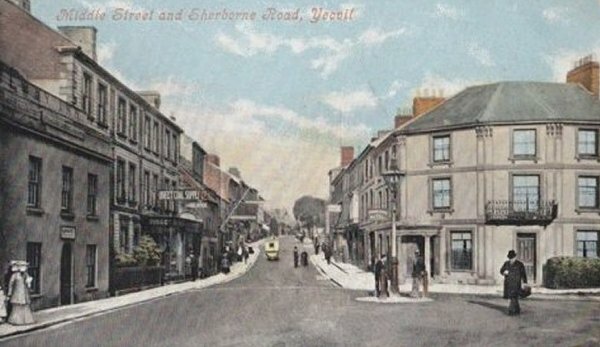 He was an advocate of public housing and Mitchelmore Road in Yeovil was named after him. He was also chairman of the Education Committee for many years. In July 1928 he was one of three Justices of the Peace appointed for the Borough. In 1930 he was made a Freeman of the Borough of Yeovil and in 1939, two weeks before his death, he participated in the opening of Grass Royal and Summerleaze Park schools. He died, aged 75, on 18 July 1939 in the Municipal Offices, as a magistrate he was waiting to go into court at the time of his death. His estate was £5,048 18s 8d and in relation to average earnings, his estate would have been equivalent to over £650,000 today. Alderman Mitchelmore, seated, at the excavation of the Westland complex in 1925. 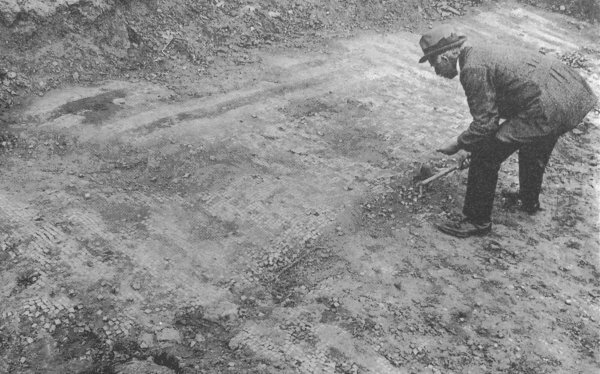 Alderman Mitchelmore examining a Roman mosaic pavement at the Westland complex in 1925. 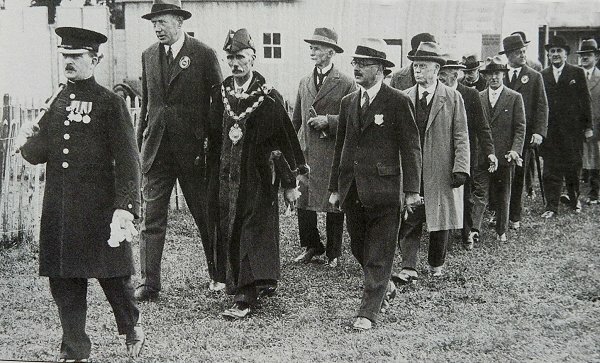 The Yeovil Town Council delegation, all looking remarkably unhappy, at the opening of the Bath & West Agricultural Show, 25 May 1932. 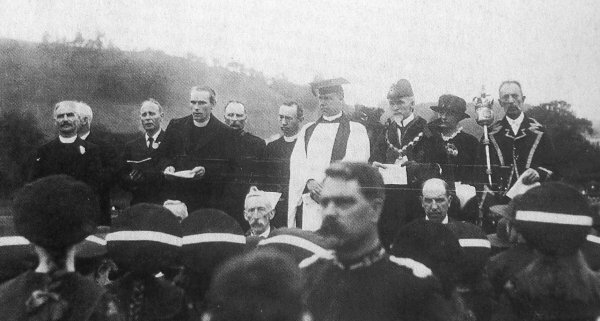 Left to right are Mace-Bearer Joseph George Boucher, Major (later Colonel) Batten the Town Clerk, Mayor Alderman William Earle Tucker looking extremely glum, Alderman William Mitchelmore, Councillor Sidney Clothier the Deputy Mayor and Alderman Jabez Matthews. This photograph of Middle Street dates top about 1900 and shows the first of Mitchelmore's temperance hotels, the Albany Hotel to right of centre. This hand-coloured postcard dates to about 1905 and shows the Fernleigh Commercial Hotel, another temperance establishment, at right. A brief article from the 26 February 1937 edition of the Western Gazette.